President Barack Obama says the Buchenwald concentration camp "is the ultimate rebuke" to those who deny the Holocaust. Mr. Obama visited the Nazi-era camp where 56,000 people died. He toured the memorial Friday with German Chancellor Angela Merkel and survivor Elie Wiesel. They placed white roses on a stainless steel memorial, kept year round at 98.6 degrees - the temperature of a living human body, reports CBS News chief White House correspondent Chip Reid. Famed CBS newsman Edward R. Murrow arrived the day after American troops liberated the camp and filed an historic, now scratchy, radio report, reports Reid. "There surged around me an evil-smelling horror, men and boys reached out to touch me," Murrow reported. "Death already had marked many of them but they were smiling with their eyes … there were two rows of bodies stacked up like cordwood." Mr. Obama said people today have a duty to confront those who deny such concentration camps existed. A somber Obama told reporters that his great-uncle helped liberate a nearby satellite camp, Ohrdruf, just days before other U.S. Army units overran Buchenwald. Mr. Obama says his great-uncle returned from war and was unable to speak of the horrible scene. The U.S. president flew by helicopter to the Buchenwald concentration camp, where an estimated 56,000 people perished. Most were Jews - worked to death, shot or hanged by Nazi guards. 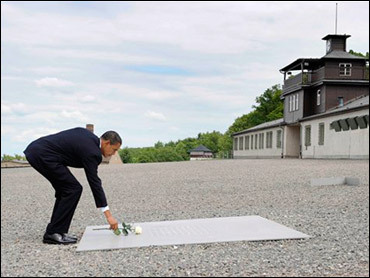 Mr. Obama became the first U.S. president to visit the Buchenwald concentration camp. An estimated 56,000 people, including some 11,000 Jews, perished there at the hands of Nazis. The stop was personal. A great-uncle helped liberate a nearby satellite camp, Ohrdruf, in early April 1945 just days before other U.S. Army units overran Buchenwald. Wiesel, a 1986 Nobel Peace Prize winner, author and Holocaust survivor, and Merkel accompanied Obama. Each laid a long-stemmed white rose on the grounds. One day earlier in Cairo, Mr. Obama issued a scathing indictment of those who question the Holocaust, saying that to do so "is baseless, it is ignorant, and it is hateful." "Threatening Israel with destruction or repeating vile stereotypes about Jews is deeply wrong and only serves to evoke in the minds of the Israelis this most painful of memories while preventing the peace that the people of this region deserve," Mr. Obama added. It was a pointed message to Iranian President Mahmoud Ahmadinejad, who has expressed doubts that 6 million Jews died at the hands of the Nazis and who has urged that Israel be wiped from the map. Mr. Obama's comments came in his long-awaited speech to the Muslim world in which he sought a fresh start in America's relations with the followers of Islam. With stops in Saudi Arabia and Egypt behind him, Mr. Obama turned his attention to Germany. He heads later Friday to France to commemorate the 65th anniversary of the Allies' D-Day invasion. In this eastern city on the Elbe River, Mr. Obama and Merkel walked together through the gate of Dresden Castle. They headed into an ornate room to sign books - he wrote "Greetings from the people of the United States!" - for Saxony and Dresden. Minutes later, they retreated to hold private talks, primarily on the nuclear standoff with Iran and the slumping global economy. Mr. Obama needed to tread lightly, since Merkel is campaigning to keep her job in a September election contest with her foreign minister, Social Democrat Frank-Walter Steinmeier. Dresden is a city with its own bitter wartime memories. Starting on the night of Feb. 13, 1945, first British, then American bombers pounded the defenseless and largely non-strategic architectural gem, igniting a firestorm in which 25,000 people died - and in so doing, creating an enduring controversy. Aides said Mr. Obama did not plan to address the firebombing, and was in Dresden at the invitation of Merkel, who hails from her country's East. 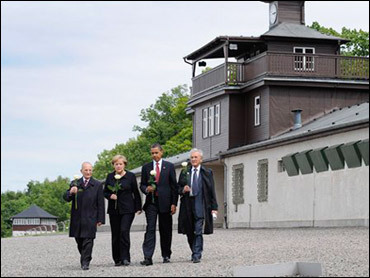 The Buchenwald stop - Mr. Obama is the first U.S. president to visit the forced labor camp - was also personal. A great-uncle helped liberate a nearby satellite camp, Ohrdruf, in early April 1945 just days before other U.S. Army units overran Buchenwald. "It was full of people," Charlie Payne, now 84, recalled of Ohrdruf by phone from his Chicago home. "The people were in terrible shape, dressed in rags, most of them emaciated. Practically skin and bones." Ohrdruf no longer stands. But Buchenwald's main gate, crematorium, hospital and two guard towers have been kept as a memorial. Accompanying Mr. Obama to the site was Elie Wiesel, a 1986 Nobel Peace Prize winner, author and Holocaust survivor, who as a boy was taken to Auschwitz, then to Buchenwald, where his father died in 1945 three months before liberation. Following the tour, Mr. Obama was flying to Landstuhl medical hospital for private visits with U.S. troops recovering from wounds sustained in Iraq and Afghanistan. And he was ending the day in Paris - reuniting with his wife, Michelle, and daughters Malia and Sasha, who planned a brief holiday in the City of Light after the Normandy ceremonies. Saturday's Normandy observance at the U.S. cemetery in Colleville-sur-Mer also was to be a moment for family memories. Mr. Obama's grandfather, Stanley Dunham, came ashore at Omaha Beach six weeks after D-Day. Dunham's older brother Ralph hit Omaha on D-Day plus four. The president summoned family memories on Thursday in making his plea for understanding to the world's 1.5 billion Muslims. Speaking at the main auditorium of Cairo University, Mr. Obama, a Christian whose father was a Kenyan Muslim, recalled living with his mother in Jakarta. "As a boy, I spent several years in Indonesia and heard the call of the azaan at the break of dawn and at the fall of dusk," he reminisced. Mr. Obama said his life's experience has taught him Islam is a religion of peace and justice. "The enduring faith of over a billion people," he said, "is so much bigger than the narrow hatred of a few."